What makes Analisa.io so special? Can I analyse any Instagram @Account? Can I analyse any Instagram #Hashtag? Why should I upgrade to Analisa.io Premium? Analisa.io Premium provides deeper industry-leading @Account and #Hashtag analytics on your-own and your-peers’ Instagram game. Get actionable AI-powered insights to guide your social media strategy and stay on top of your game. See Upgrade Pricing! How do I upgrade to Analisa.io Premium? What payment options are there to upgrade to Analisa.io Premium? Analisa.io supports secured Credit Card or Paypal payment options. See Upgrade Payment Options! Can Analisa.io boost my followers? Analisa.io provides AI analytics on Instagram @Profiles and #Hashtags that users can use to gain insights and inspiration on how to grow their Instagram Profiles. Our clients typically use Analisa.io for Engagement Analysis, Content Selection, Competitive Analysis, Influencer Performance Analysis, Brand-Influencer Mapping, UGC Analysis, and Campaign Reporting. However, Analisa.io is not a tool for getting artificial followers boosts. to analytics that Instagram has provide? Analisa.io Premium provides deeper analytics result of ANY @Account and #Hashtag which include audience behaviour, brand-relationship mapping, influencer identification/ranking, competitive intelligence, and many more. Check our interactive premium analytics to see it in action! Do you have free trial for Premium plan? 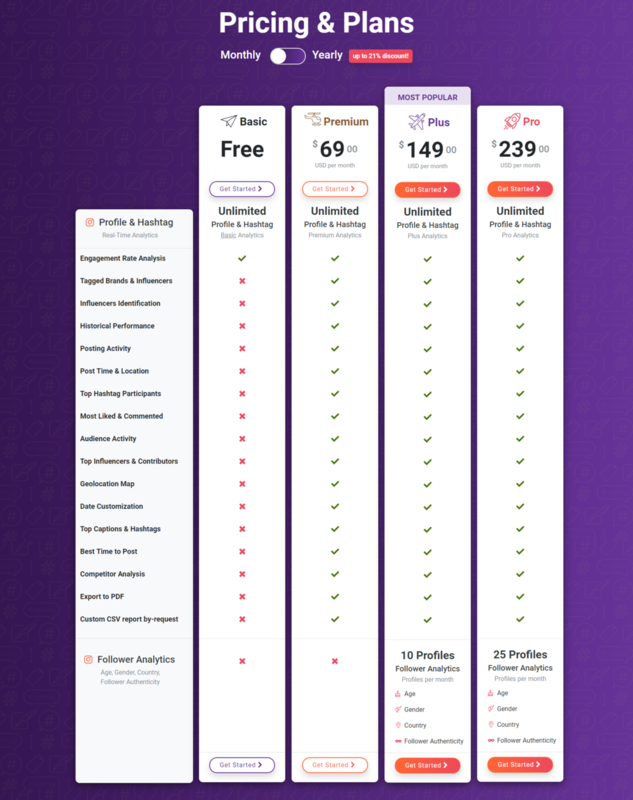 We do not offer a free trial since Analisa.io Basic is completely free for unlimited-use for signed up users :) You can always upgrade anytime should you need deeper analytics and insights. How many Instagram account and hashtag can I analyze under one Premium account? For Premium Plan we do not have a limit on how many Profiles and Hashtags you can analyze given that they are public (not private) account and are not 18+ restricted (for example, profiles for liquor brands). Can I cancel my Upgrade Subscription anytime? We would be sad to see you leave, but you can cancel your subscription anytime by chatting with us or send us an email to lisa@analisa.io. Kindly note that the minimum subscription term is 1 month, with no pro-rated refund for unused periods of any month. You will still be able to analyze any @Account or #Hashtag on Analisa.io Basic. Does my subscription automatically renew each month/year? Yes, your subscription automatically renews each month or year according to your chosen plan. I’m in love with Analisa.io, how do I learn more about it?